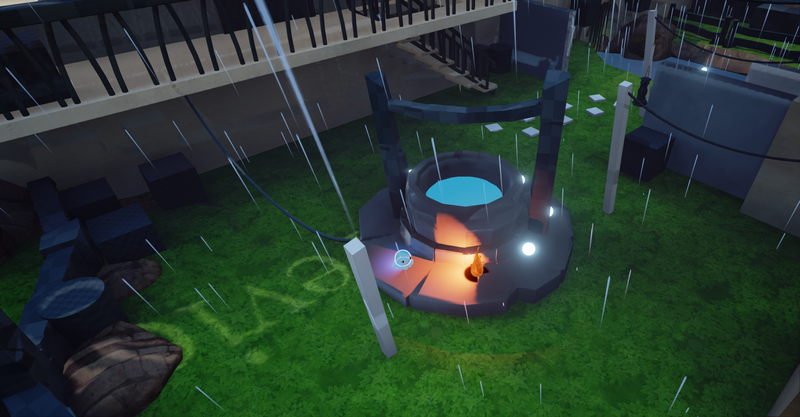 I wanted to make a start this week on making some of scene effects, first off the rain establishes a lot of the mood of the level so I worked on that first using UE4's cascade editor. Rain! Coming from the ground! The rain itself did not take too long at all, the problem with it though is that it doesn't collide with the scene geometry so I need to think of a way to solve this as we don't want it raining indoors. Also for some reason the rain drops appear to be reversed so they are actually heavier at the top, so I need to figure out what is happening there. Something else I have to add as part of the rain are the splashes on the scenery which appear when the ground is hit by a rain particle, I can do this with particle hit events that will spawn a mesh particle when it hits the ground. Here is some screenshots from this week of the level, I tried stacking some of the buildings a bit more to make it feel a bit more cramped but at the moment we feel as if the town doesn't look the way we wanted, the buildings will need to be more broken up and have more character and the town looks too aligned to the grid which makes it less interesting. We had a group meeting and decided for a different approach on the buildings, which should help the level a lot more. The plan is to be slightly less basic with the buildings and create building parts out of kitbashed pieces so we could get in a lot more detail and flesh out the level very quickly.